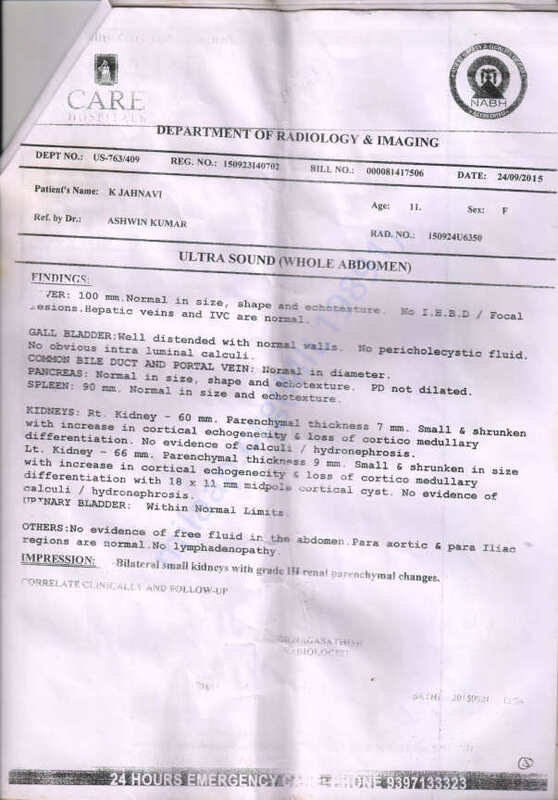 My brother knows Jahnavi's parents personally, When Jahnavi was 11 years old (in 2015) doctors have diagnosed her with Chronic Interstial-hepatitis (CKD Stage -V, both the kidneys are failed)) and she was counselled for various aspects of dialysis and Kidney transplantation. 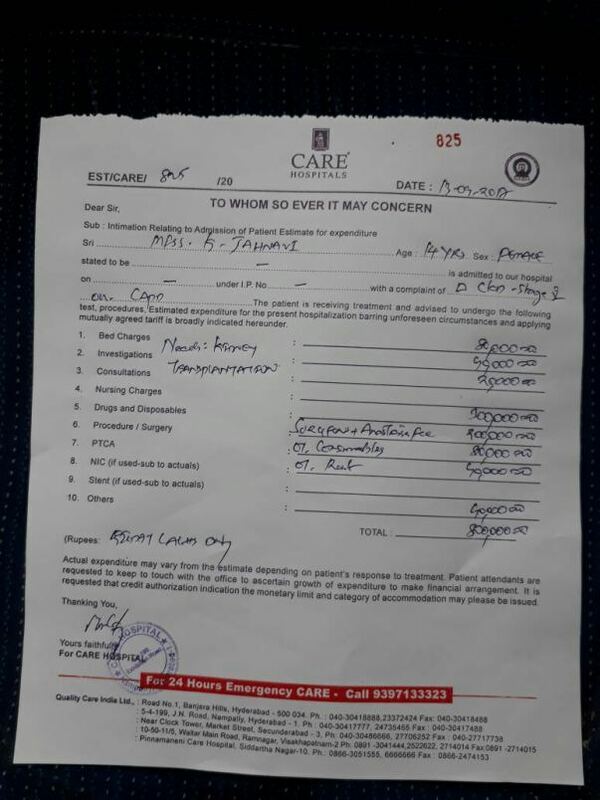 From 2015 on wards she is on continuous dialysis, so far, her parents have spent lot of money for dialysis by taking loans from banks and people etc. 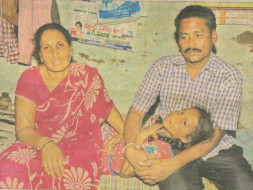 Now they don’t have money to continue the dialysis any more and are requesting for help. 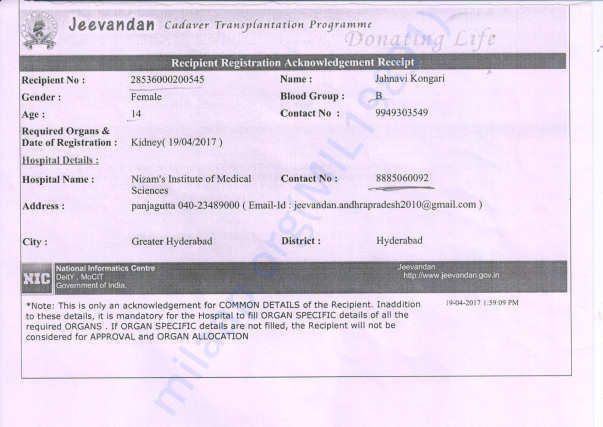 Her parents have registered for a Kidney donor with Jeevandan on 19th April 2017, a govt initiated transplantation programme, as soon as they find a donor kidney transplantation will be done. 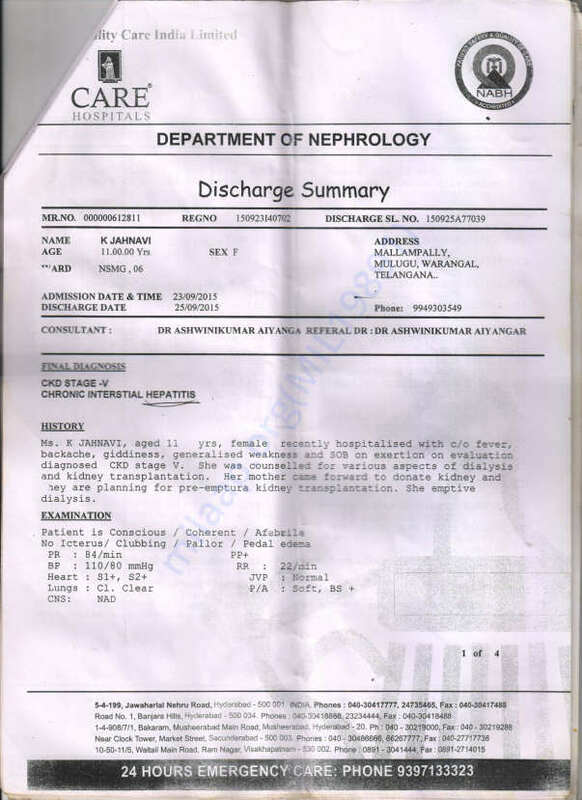 I request all of you to donate some amount so that Jahnavi can under go for dialysis without any problem and also for her kidney transplantation. I have attached the reports for your information. Feel free to contact me or Jahnavi's father Raju on 9949303549 if you need any further information. Here is an update on Jahnavi's health, recently doctors from NIMS have called her for some additional tests so that she can be ready for transplantation whenever she gets a compatible organ doner. 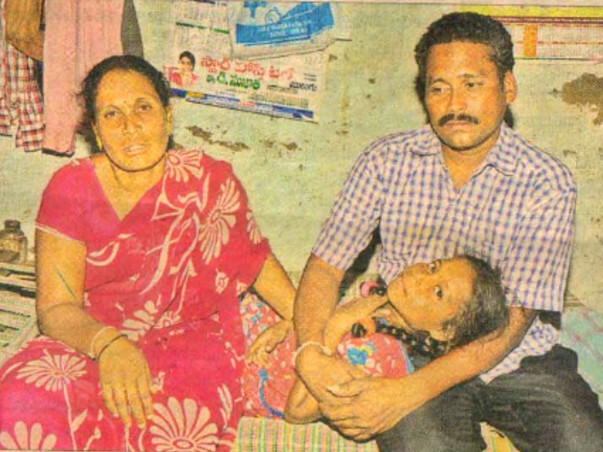 Jahnavi's parents are continuing the dialysis regularly and her health is stable. 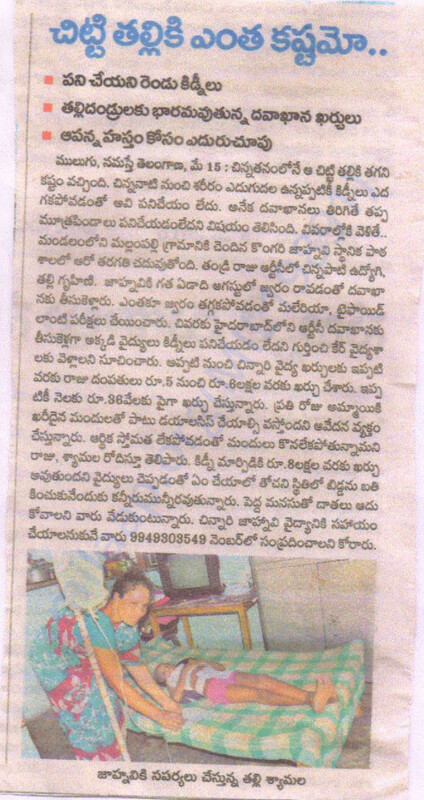 I am transferring recently received fund to her father's account towards expenses for medicine. I thank you all for helping Jahnavi's dialysis so far. I request you all to share with your friends and colleagues about the same. Here is another update on Jahnavi's health, she went for consultation on 5th March and doctor suggested her parents to give her good diet so that she will gain some more weight to be fit for Kidney transplantation. There is good probability that she will get a kidney in this month or next month as her weighting list number is one. 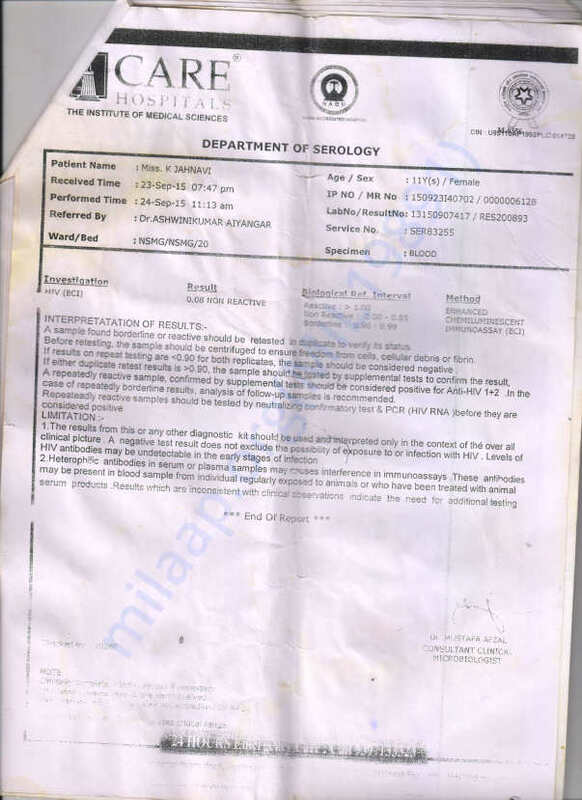 I am withdrawing remaining money towards her medicine for dialysis for this month. I once again thank each one of you for the support. Please do share the campaign further with your friends and family. Will keep you posted. 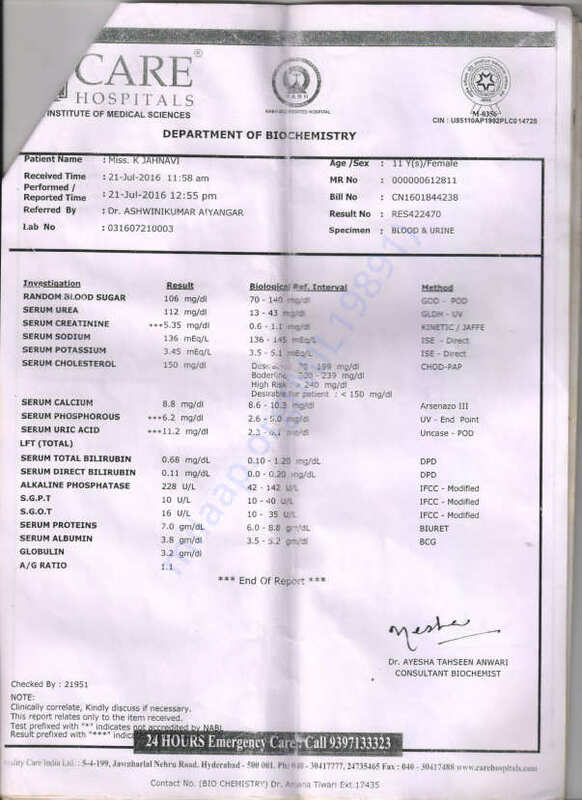 Their waiting list number at Jeevan dan is sitting at one, there were few donors in the month of January but the kidneys were not the best match. As soon as they find a suitable donor Jahnavi will undergo the transplantation. 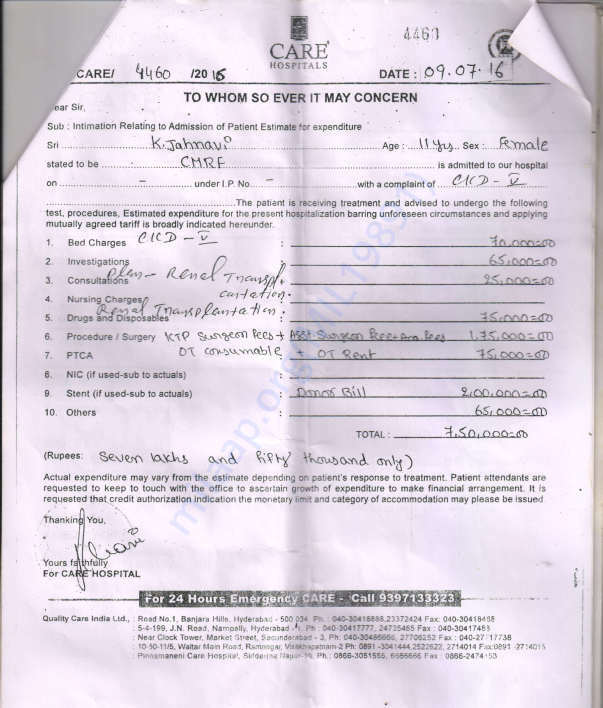 I am withdrawing Rs.35,000 which will be used to buy medicine for Jahnavi's dialysis. I once again thank each one of you for your support and blessings.